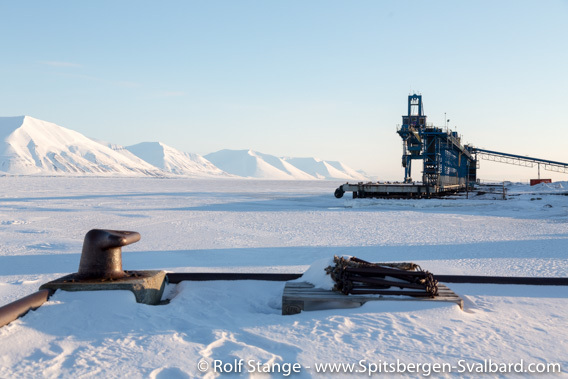 Store Norske Spitsbergen Kulkompani (SNSK), owner of the former coal mining settlement of Sveagruva, has got permission from the Sysselmannen to break the fjord ice in Van Mijenfjord to the harbour of Svea. Van Mijenfjord is sheltered from the open sea by the island of Akseløya, which is almost blocking the entrance. Hence, the fjord is is settling earlier and getting more extensive there than in any other fjord on the west coast of Spitsbergen. The fjord ice in Van Mijenfjord is an important habitat which is not available anymore elsewhere as widely as earlier, due to the warming climate. Ringed seals need fjord ice in spring to rest and to give birth and polar bears frequent the ice to hunt. Ice chart: Van Mijenfjord is the only fjord in the region with a large area of solid ice. 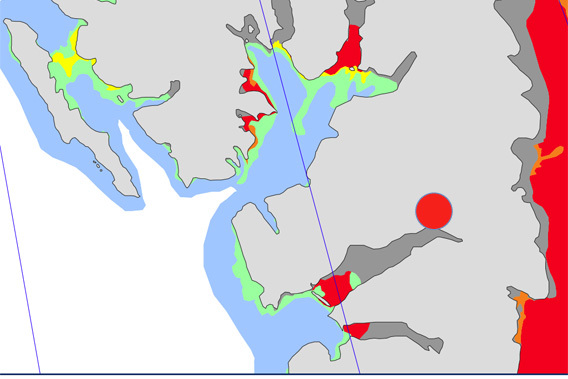 The fjord ice will be broken all the way to Sveagruva (red dot). Chart © Norwegian meteorological Institute (dot added). Usually, the authorities consider the fjord ice environmentally very important and will not give permission for ice breaking. Even non-destructive traffic with snow mobiles is now restricted: snow mobiles are not allowed anymore on large parts of the fjord ice in Tempelfjord, to avoid disturbance of wildlife which only occur in cases of reckless behaviour. Such traffic bans were also considered for Rindersbukta which is part of Van Mijenfjord, but not (yet) implemented. Other rules seem to apply for breaking the ice, or at least the same rules are given a different interpretation. The Sysselmannen emphasizes in a press release that traffic in Spitsbergen is supposed to happen in a way that does not harm the environment or disturbs animals or people unnecessarily. But in this case, the economical interests of Store Norske were given more weight than the protection of the wildlife that needs the ice in times when it has become rare in Spitsbergen. The background: Sveagruva is running out of diesel. Stocks were supposed to last until summer 2019, but consumption during the winter was higher than expected. Diesel is not just used for vehicles, but also to run the power plant in Svea, which is supplying the settlement with electricity and warmth. The current stock would now last “probably until May, approximately”, according to the Sysselmannen’s press release. And not until the summer, when the fjord ice would be gone anyway. Without diesel for the power station, Svea would have to be evacuated. The consequence would not only be a temporary stop of the clean-up that has recently begun, but possibly also damage to the infrastructure. This would involve serious economical consequences for Store Norske. This is the reason why the company has got permission to break the ice and take a ship to Kapp Amsterdam, the harbour of Sveagruva. Technically, an overland transport from Longyearbyen would be possible, but this would involve approximately 60 tours. The total strain on the environment and the risk of pollution is considered higher and hence transport by ship was given priority. The harbour of Sveagruva at Kapp Amsterdam. In earlier times, when Sveagruva was still an active mining settlement, it was not unusual to break the ice in spring to ship coal. But times are different now. No coal is mined anymore in Sveagruva, and there is much less ice in the other fjords in Spitsbergen and this ice may not even be used for snow mobile traffic in certain fjords, opposed to the wishes and economical interests of many. It is not surprising that the permission to break more than 30 kilometres of solid fjord is is met with public criticism. The weather in the days after breaking the ice will be important: if it remains cold and calm for a while, the fjord will quickly freeze again. But a storm might break up large areas of weakened ice.